His kisses felt different, more real than the fictional story we’d been telling one another every single day for the past few weeks. He hadn’t said the words, and I hadn’t either, but our kisses felt like we were begging for a little more time. A few more touches. A few more skipping heartbeats. 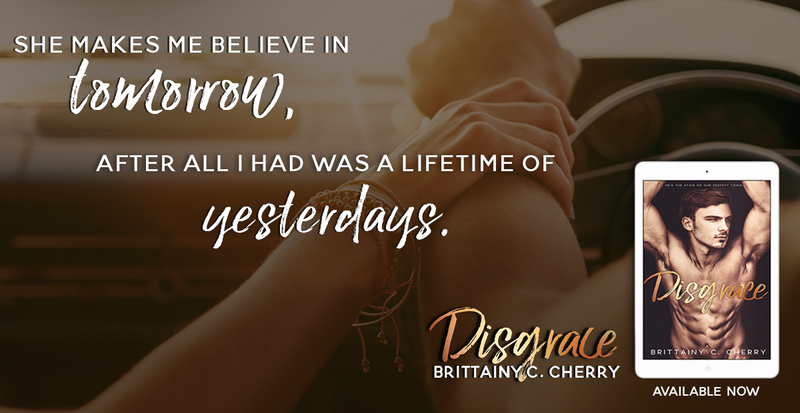 I’ve come to expect nothing short of perfection when I pick up a new book by Brittainy C. Cherry! Each time she never disappoints me. Her stories are filled with so much heart and what I’ve learned is that her characters are multi-dimensional. Every time I’ve hated one or more of her secondary characters for their cruelty, in the end, we learn what made them that way and there’s always room for redemption. So I try not to hate some of her characters, but in this one, it was truly a test of my patience! Grace Harris and Jackson Emery are from completely different worlds and in their small hometown of Chester, one is considered royalty while the other is the black sheep. But both Grace and Jackson know a thing or two about being abandoned by the ones they love most and it has left them broken. Grace has come home to Chester to find solace in the arms of her family while she tries to mend her broken heart over her failed marriage. But the only people who are there to comfort her are her sister and the most unlikely person of all, Jackson Emery. Jackson and his father have been the town outcasts for as long as he can remember. He was never made to feel welcome. Throughout his childhood, he was bullied severely and the only comfort he found was in the arms of his mother and getting the unconditional love from his loyal dog, Tucker. When his mom died, his life went with her. His father turned to alcohol and became a shell of the man he used to be. Jackson’s life was no longer his own. He stayed in a town full of people who hated him and wished him gone only because he made a promise to the one person who mattered the most to him. Years of misery has hardened his heart and he’s accepted his role as the town bad guy. When Jackson and Grace meet, he is his usual rude and belligerent self. Grace is a little taken aback by his behavior but she’s not like the rest of the town in that she is not quick to pass judgment. She can sense there is more to his story. Grace is a people pleaser. She’s always been taught to act like the perfect young lady and never to act out and the town simply feeds off her current misfortune. The way her marriage has scandalously ended has become fodder for town gossip. Jackson ends up coming to her rescue on more than a few occasions when she finds herself in a deep panic attack. Grace and Jackson wind up having a steamy summer romance that they both agree can be nothing more than a temporary fling since Grace goes back home to Atlanta when summer is over and Jackson is not the type of man that does relationships. Spending days and nights talking about their likes, dislikes, dreams and sharing their love for books, will soon have them realizing their hearts are far beyond entwined. Will they be able to walk away when they have finally found their true soulmates? DISGRACE is currently available! Definitely a must read! !